AUSTIN, Texas - Feb. 2, 2019 - PRLog -- Bill Hulsey Patent Lawyer has been honored with Martindale-Hubbell's 2019 AV Preeminent rating for both legal ability and ethical standards. The AV Preeminent is the highest peer reviewed rating offered by Martindale-Hubbell, the world's most trusted attorney peer-reviewed rating service and legal directory. The rating is testament to the fact that a lawyer's peers rank him or her at the highest level of professional excellence. Mr. Hulsey is the founder of HULSEY PC and practices Intellectual Property law in Austin, Texas; Rochester, New York; and Memphis, Tennessee. A native of Memphis, Mr. Hulsey earned a J.D. from the Vanderbilt School of Law where he was Senior Managing Editor of the Vanderbilt Law Review and graduated Order of the Coif, as well as a Masters in Economics from the University of Virginia focusing on technology industry economic development. He served as an Officer on nuclear submarines in the U.S. Navy. About Martindale-Hubbell: Since 1896, Martindale-Hubbell has worked to match clients with the attorneys who can best help solve their legal requirements. Now a leading global network of over one million lawyers, the organization tracks and recognizes excellence in the field. The Martindale-Hubbell® Peer Review Ratings™ and Martindale-Hubbell® Client Review Ratings are recognized as the gold standard in attorney ratings. Within those ratings, Martindale-Hubbell singles the AV Preeminent rating as their highest level of recognition. These attorneys are chosen after a carefully managed, monitored, and confidential client review process. More information is available at www.martindale.com. 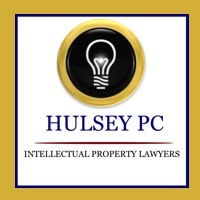 About HULSEY PC: In 2003, Bill Hulsey started HULSEY PC committed to promote entrepreneurship and the protection and commercialization of his clients' intellectual property rights. HULSEY PC takes pride in obtaining for its clients expertly drafted and strategically considered patents, trademarks, copyrights, and related agreements and official filings. Mr. Hulsey has been involved as IP counsel for the intensive due diligence phases of a number of multi-million dollar corporate transactions involving clients in the telecommunications, photovoltaic solar cell, and electronic medical sensor technology fields. As a result of the IP protection and commercialization efforts of his firm, clients have received multiples of their initial valuations in these transactions. For more information, go to http://hulseyiplaw.com.